DON'T YOU GET ANNOYED WHEN YOU ACCIDENTALLY TYPE EVERYTHING WITH CAPS LOCK ON? Wouldn't it be awesome if you could just select the text and press Caps Lock again to reverse the mistake instead of typing it all over again? SmartCapsLock lets you do just this. Or do you wonder why that key sits in your keyboard even though it serves no purpose for you? SmartCapsLock finally gives a use to the key and makes it very convenient when you need to quickly transform any text to a different case (UPPER CASE, lower case, Capitalized Case). 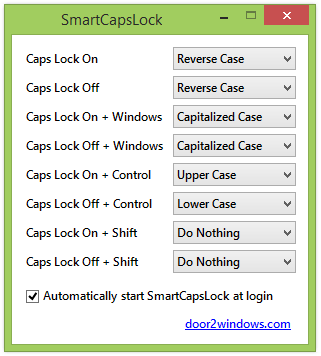 SmartCapsLock is compatible with Windows Vista and later. If you're looking for the OS X version, click here. Known issue in SmartCapsLock for Windows: if the clipboard doesn't contain text (contains files or something else) and you select text and press Caps Lock the clipboard will get emptied/cleared. This is a limitation of the Windows API and nothing can be done about it. If you are using Windows 7 or Vista, you'll have to install .NET Framework 4 first. Click Automatically start SmartCapsLock at login so that the app automatically starts with Windows. Make sure you don't move the app from the directory it currently exists in or you'll have to click the option again. Caps Lock will revert to its original behavior when the app isn't running. Here you can also change which key combination will transform the selected text to reversed case, upper case, lower case or capitalized case. Thanks to LOTRcrr for the idea.